In Euclidean plane geometry, a quadrilateral is a polygon with four edges (or sides) and four vertices (or corners). Sometimes the term quadrangle is used so it's like triangle, and sometimes tetragon to be like pentagon (5-sided) and hexagon (6-sided). The origin of the word quadrilateral is the two Latin words quadri, a variant of four, and latus, meaning "side". Quadrilaterals are complex, also called crossed (self-intersecting), or simple (not self-intersecting). Simple quadrilaterals are either convex or concave. All the sides of a quadrilateral are straight, and the interior angles of a quadrilateral add up to 360°. This is a special case of the n-gon interior angle sum formula (n − 2) × 180°. All non-self-crossing quadrilaterals tile the plane by repeated rotation around the midpoints of their edges. 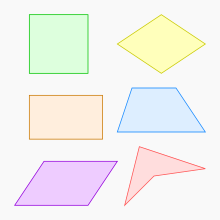 There are 6 special kinds of quadrilaterals; square, rectangle, rhombus, parallelogram, kite, and trapezoid. Although squares, rectangles, and rhombuses are technically types of parallelograms. This short article about mathematics can be made longer. You can help Wikipedia by adding to it. This page was last changed on 8 September 2018, at 16:22.